Did you finish reading all the books on your spring reading list? If not, why not? I'm terrible at non-fiction reading. Taking a look at my list (on the right side bar) you will see one book crossed out. I'm just not good at it. I'm not a cerebral person and like to disappear when I'm reading, not tax my brain. My YA fiction is completely crossed off. Those books were pretty easy and fun to read. Wahoo, success. I was able to add 2 audiobooks that added a new element to my daily reading. I wish more Christian books were offered in this format. The general fiction category was my favorite by far. There are 2 books on that list that I didn't receive for review so I'll have to grab those on my own. The rest are thankfully checked off. Along with many other bloggers, I ended up adding more books than expected to my list. I received 4 books to judge that I wasn't expecting and added a couple to the list and left 2 off. I didn't get to read them all because of time constraints. Being a single mom with 4 kids doesn't leave any spare time. I also had a daughter going to her 1st prom, graduating, son's party, and planning a grad party. My brain hasn't been completely in reading this Spring. It looks like altogether including the 2 books I didn't list from the judging I read 24 books. What was your favorite book you read this spring? Why? 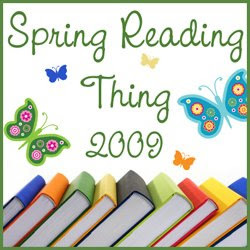 My favorite books to read this time were: Cathy Marie Hake's Whirlwind, Julie Klassen's Apothecary's Daughter, Julie Lessman's A Passion Denied, and Traci e Peterson's series. There wasn't a book on my list that I didn't like. Thank goodness. Did you discover a new author or genre this spring? Did you love them? Not love them? This was the first time I'd read anything by Robin Lee Hatcher. I read her book A Vote of Confidence and really enjoyed it. I also enjoyed Allie Pleiter's book Masked by Moonlight. I'd never even heard of her before and was surprised at how much I enjoyed the story. That a lot of the books I had to read were for other purposes. If I hadn't had to review most of the books I probably wouldn't have read as many as I did. To see how many books others have read, I wonder where they find the time! It seems nearly impossible to me. I can't even believe I read 24 books. I'm also in the middle of 3 at the moment that I've been reading this past week that weren't on the list: Talking to the Dead by Bonnie Leon, Get Out of My Face! : How to Reach Angry and Unmotivated Teens With Biblical Counsel by Rick Horne, and A Voice in the Wind by Francine Rivers. I'm loving all 3. Great job on the challenge! You have been busy this Spring! I just brought home The Apothecary's Daughter yesterday, can't wait to get to it. Congratulations; you did a fine job. I liked Talking to the Dead. Good job! 24 books is fantastic -- especially with everything else you had going on. I've been listening to more audiobooks lately -- I, too, love that option. Thanks again for being part of the challenge! For such a busy mom, you did great! I really enjoyed A Vote of Confidence, too. Wow! You read quite a bit - great job!